14 year-old Billy Batson (Asher Angel) keeps running away from foster homes while searching for the mother who lost him when he was a young child. 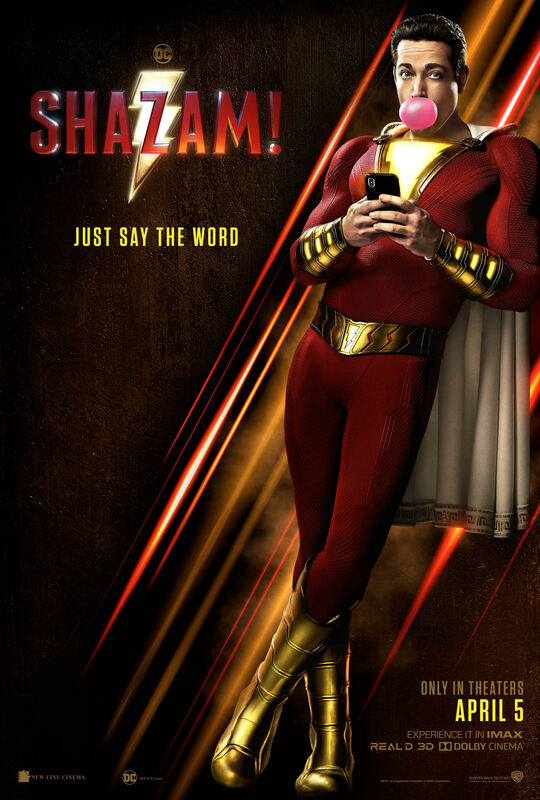 Magically abducted by the wizard Shazam (Djimon Hounsou), he gains the ability to transform into a muscular, super-powered adult (Zachari Levi) whenever he says the wizard’s name. What, honestly, are the odds that a publisher called Fawcett would release a superhero named Captain Marvel in 1940, who would later be licensed by DC Comics and revived in the 1970s, and that Marvel Comics would also publish a superhero named Captain Marvel in the down-time between Fawcett and DC’s editions, and that both Captain Marvels would be adapted into live-action films within a month of each other, and that both Captain Marvel movies would be so good? Of course the hero of Shazam! is not called Captain Marvel any more. In fact, he doesn’t even properly get a superhero name unless you count one of the film’s more delightfully silly gags. Shazam! is a genuine surprise. Its source material has a clear 1940s naivete to it, with magic transforming an earnest boy into a grown man thanks to a wizard who lives on the mysterious ‘Rock of Eternity’. It is a concept that flies counter to Warner Bros’ previous “DC Extended Universe” films like Suicide Squad, Batman v Superman, and Man of Steel, that have all pursued dark, relatively grim takes on formerly bright, optimistic comic book characters. The company’s tone is now flying in the opposite direction following the likes of Wonder Woman and Aquaman, and Shazam! sees it reach an apex of upbeat charm. This is the breezy space in which DC’s characters best reside. This is the tone of Richard Donner’s Superman that nailed the DC aesthetic so well, only performed as a comedy. It is genuinely quite something. Is it perfect? Absolutely not, but it keeps it heart in the right place and its content in a neat mid-point between action film and family comedy. Asher Angel do a superb job of sharing the role of Billy Batson, while Jack Dylan Grazer is excellent as enthused sidekick Freddy Freeman – albeit once again showcasing Hollywood’s penchant for casting able-bodied actors as disabled characters. Mark Strong does a classical turn as the film’s villain Dr Thaddeus Silvana, and thankfully plays a potentially campy role dead straight. It is surprising just how enjoyable the supporting cast are as well, particularly young Faithe Herman as Billy’s foster sister Darla. She shows off not just talent but superb comic timing. The biggest surprise of the film is just how authentic and honest it feels. It is based around a concept that is ripe for parody or cynical commentary, and it indulges in neither. The laughs it generates are well-intentioned ones, and it fully commits to its old-fashioned premise. It is not just a fun film but a likeable one too, and it gets more likeable the further the story goes. It is not the best film you are likely to see from 2019, but it is absolutely one of the most charming. Not only does it further enhance Warner Bros’ improved creative direction, it works perfectly as a self-contained, hugely enjoyable, wholesome sort of a film. We simply do not get films like this enough.